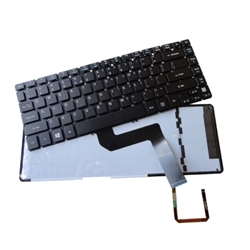 Description: New original Acer laptop backlit replacement keyboard with ribbon cable. This genuine part is brand new and is used to replace your worn or damaged notebook keyboard. It is best to replace the whole keyboard rather than to try and repair missing keys. Part #'s: NK.I1417.02K, NK.I1417.072, AEZ09R001100, NSK-R2BBQ 1D, 9Z.N8DBQ.B1D.